It’s always fun to make a prank call among your friends. What you think about pranking your friends with 37 hilarious characters. Thanks for JBMJBM, LLC for developing such a prank app for iPhone called Prank Me!. How actually Prank Me! works. It allows the user to select the character and then to hit the call button to dial numbers. You can make use of your friends contact stored on your iPhone and thus make the prank call. Thankfully all characters are professionally dubbed male and female voices. 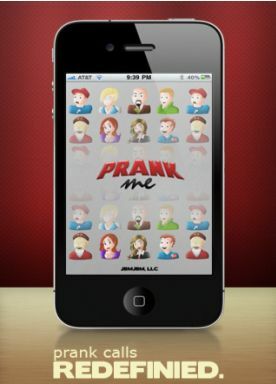 Prank Me iPhone app has extraordinary feature by giving a call back number. If your friend calls that number, he will be notified with a message – “you have been pranked”. Really pretty nice feature that you can’t see in other prank apps. Yo can enjoy the additional features in the pro version of this app. Additional feature allows you to select the audio clip you want to play, pre-packaged set of audio clips and many more. Check out the more other features in app store. Finally I have to say that the voices that are used for pranking is seem to be real. And my friends can’t able to find that it is a prank call. 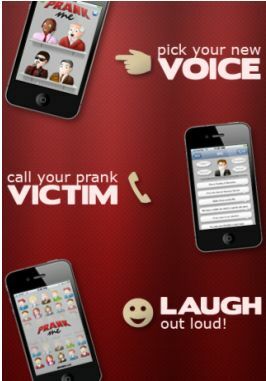 Prank Me!- make a prank call among your friends and have a great entertainment! Downlaod Prank Me! app here!